Infants, children, and adolescents are at increased risk for heat-related illness due to their inability to remove themselves from dangerous environments. Evidence shows that morbidity and mortality from heat illness is related to the length of time core temperature is elevated, so rapid reduction and accurate serial measurements are crucial to prevention of organ system damage and death. The primary methods of patient cooling are conduction (ice-water immersion, cold packs) and convection (moisture and moving air). The choice of method used may depend on availability of equipment, but there is evidence that can guide optimal use of resources. 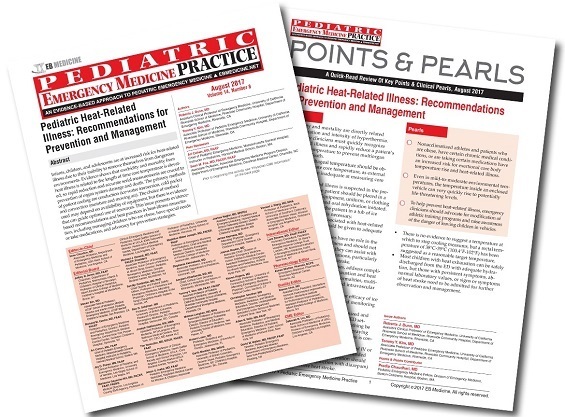 This issue presents evidence-based recommendations and best practices in heat-illness resuscitation, including managing children who are obese, have special needs or take medications, and advocacy for prevention strategies. On a hot summer day, an obese 15-year-old adolescent boy presents to the ED after a week of two-a-day football practices. He has completed 10 practices to date. He presents with headache, muscle aches, nausea, and 2 episodes of vomiting. The patient denies any trauma or injury. His past medical history includes ADHD, and his home medications include methylphenidate. His physical examination is remarkable for a fatigued-appearing obese boy with flushed, sweaty skin. The patient’s vital signs are: heart rate, 120 beats/min; respiratory rate, 24 breaths/min; blood pressure, 128/76 mm Hg; rectal temperature, 39°C (102.2°F); and oxygen saturation, 98% on room air. You begin to wonder how severe his heat-related illness is and whether diagnostic studies need to be ordered. What treatment needs to be initiated immediately, or can treatment wait while you see another patient? 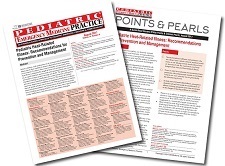 While you are considering these questions, EMS brings in a lethargic 8-month-old infant. The paramedic reports that a bystander found the infant in a locked vehicle. The parents could not be located, and the amount of time the child was in the car is unknown. The physical examination demonstrates an obtunded infant with no evidence of sweating. The infant’s vital signs are: heart rate, 192 beats/min; respiratory rate, 20 breaths/min; blood pressure, 70/45 mm Hg; rectal temperature, 41°C (105.8°F); and oxygen saturation, 92% on room air. You consider whether this is heat exhaustion or a more severe case of heat stroke. You begin to think about the diagnostic studies that you will need to order to confirm the diagnosis and when you should begin treatment.